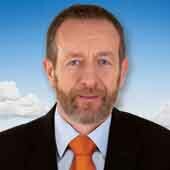 I am currently an MEP for Munster and have been for the last two years. Prior to that I was in the Institute of Sport in Dublin and served as the executive chairman and prior to that I was the president of the GAA for three years. Originally, I was a teacher in Killarney for a good number of years but as you can see I have changed from that background now. an awful lot of imponderables when travelling abroad leading to a lot of flights being delayed. One of these was the volcanic ash cloud. I remember that was one of the most horrific experiences of my life and I wouldn’t want to go through it again. connection with Dublin airport which is problematic for me as I use the airport a lot. Driving would be my second choice. I enjoy driving mostly and I suppose I don’t mind flying either. As long as they’re dependable. That is the key for me. If they go when they are supposed to go and arrive when they are supposed to arrive then I’m happy. What happens in between, in terms of luxuries etc. makes no difference to me whatsoever. competition. All the flights were organised for us. We all travelled in economy seats but it was pleasant and good fun. I also went to San Diego and Honk Kong with the family. So certainly I would have enjoyed them. trying to get home from Brussels. I got caught everywhere. I went to the airport in Brussels and the flight was cancelled. Then I went back to the office and tried to book a flight out of Paris and when I got there the flight had been cancelled again. So I decided to try and get a train to Calle but I couldn’t. Eventually I got a train to Lille and then onto Calle. From there I had to get a car to pick me up and bring me across on the ferry. I had planned on getting a flight out of Heathrow then but again that was cancelled at midnight. So I was after travelling for a long time and then had to try and get on another ferry to get me to Rosslare. I got there to find out that I had just missed a train to Dublin by five minutes. Eventually I managed to get a lift to the Burlington in Dublin and then a taxi to Dublin Airport. Thankfully the flight went from Dublin and when I landed and sat in my own car I was the happiest man alive. I understood what independence was about and I understood what living on an island was about in terms of the restrictions it can impose on you. I’ve had some other bad days travelling. Around 2 weeks after the ash cloud trapped me first it got me again. I was on my way to London, ticket booked and everything, but that was cancelled and I had to change and make my way to Holyhead instead. I had to queue and wait to get on but then it turned out that no train was going from Holyhead to London. Thankfully I met two people who were going to London from Holyhead in a small Jaguar. So they gave me a lift in the back of the Jag and I never felt bigger in my life. I felt like a massive man in the back of that Jag. I’ll never forget it. blizzards came down. We were after making our way through the terminal and just after buying some duty free and it was announced that the flight was cancelled. Then we had to go back out and customs accused me of having the duty free without tax so I went through a huge rigmarole there before they eventually copped on and saw there was nothing wrong with it. Then we had to queue to get out of the airport. vacate the airport. I then went back in and after getting myself to the top of the queue after two hours before the scare I was forced to join the end of the queue. Eventually we said we weren’t going to have anything to do with it and decided to go back to Brussels and try get on a flight back there. So we tried to book a train and had to wait for a couple of hours to get on one and once we got on one we didn’t even get a seat. We were all bunched in like sardines and it took us five hours to get to Brussels when it should have only taken three. We had to change trains to get to the airport and I was 300 yards away from the airport and the train broke down. So we got out and we had to stand in the freezing cold until a bus came along to bring us to the airport and we just managed to catch our flight home to Dublin airport. did anyway. I suppose she was right because the roads coming out of Dublin weren’t too bad but once I got to Port Laois the roads got worse and worse. I finally got home at six o’clock in the morning after leaving Dublin at 12. I must say that I think the state of the Irish Transport system has improved; no doubt about it. I mean obviously there are the new motorways which are a huge advantage for drivers. The supply of trains has improved hugely. I mean you have trains from Cork to Dublin every hour and there are trains to Kerry every two hours which is great. But there has been a decline in the regional airports around the country due to funding and routes being cut etc. which is bad to see. What I always say is that I want to know when my flight is going and at what time it gets in and from my experience I have to say that Ryan Air are the most reliable. Aer Lingus, whilst they are nice to travel with, are often late. For one reason or another, which might be out of there control, you can never say with confidence that you will be on time. Ryan Air has brought competition to the market along with new routes and I think that once you know their system you can fit into it. But, if you don’t know their system or fail to book in on-time then they will eat you. If I was going to give advice to anyone travelling it would be to check out the details before you travel, especially if you have connecting flights. You need to look at what terminals you need to go to and how to get there and how long it takes to get from one to another. Check if you can walk it or do you need to get a bus or a train there like in Heathrow and Paris which are both nightmares. Then of course make sure you have your documents in order. That’s always very important. That would be my advice anyway. Error: Error validating access token: Session has expired on Monday, 22-Apr-19 15:56:05 PDT. The current time is Tuesday, 23-Apr-19 09:34:18 PDT.